Before we'd even picked up the rental car in Hawaii, Ben was making a list of all of the alcohol he needed to buy for the house in order to make a Mai Tai immediately upon arrival. When he learned that we needed to detour and pick up some friends, I'm pretty sure he pitched a fit about the obstacles standing between him and the Mai Tai prep. I am personally not a fan of pineapple (fresh pineapple makes my mouth itch), any sort of rum that isn't making me a mojito, and maraschino cherries so I did the boring thing and got myself some gin and tonic supplies. Withdrawals from vacation have been really severe, so we threw a Hawaiian-themed party last weekend to throw ourselves back into the island life. Ben made Mai Tais, I made spam musubi, our friends brought over watermelon and pineapple to share, and we finished the night with Hawaiian chocolate we picked up on Oahu. If you can't get back to the islands, bring them to you! 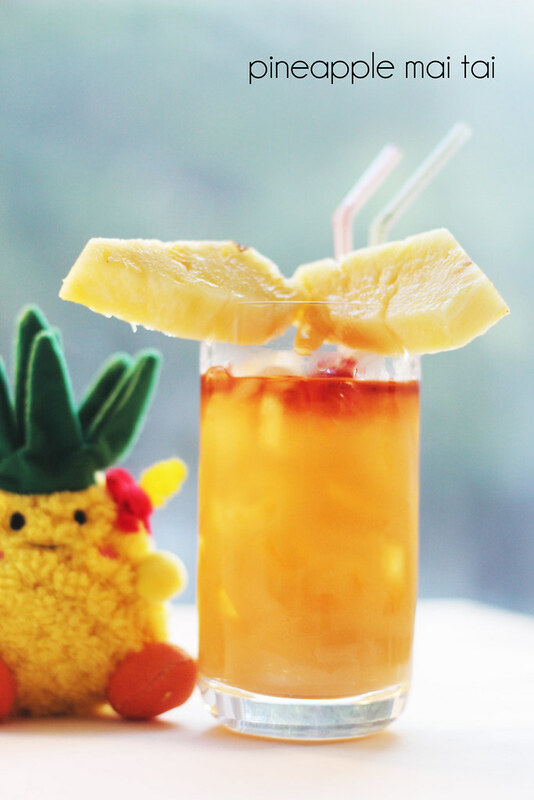 Read on for Ben's pineapple Mai Tai recipe! Fill a tall (tom collins or highball) glass with ice. 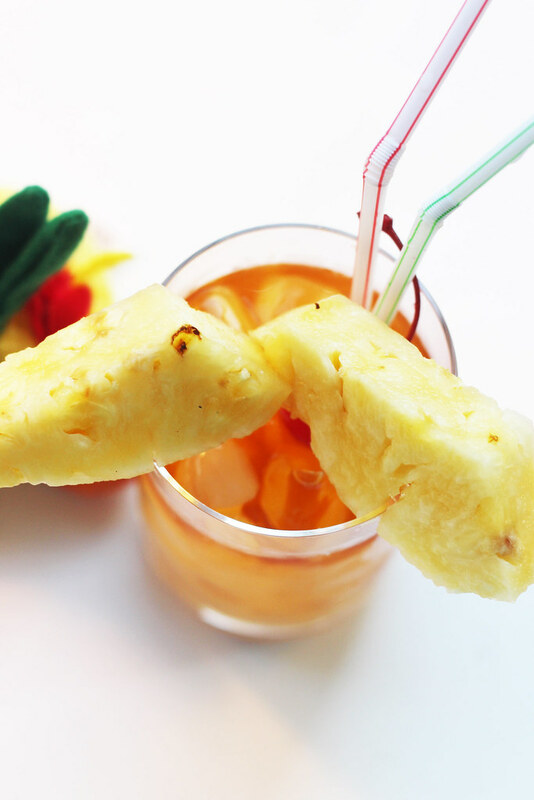 Add golden rum (not spiced rum), pineapple juice, orange juice to a separate glass, shaker or pitcher. Mix well. Pour in your glass full of ice. 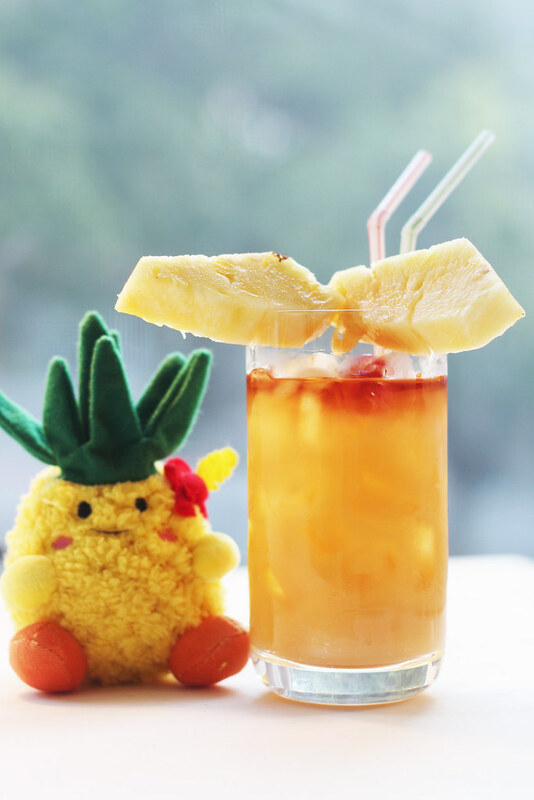 Float dark rum on the top of the glass and garnish with loads of pineapple and a maraschino cherry. That looks absolutely delicious, I'll definitely make it! This looks delicious, I will be trying this for sure.